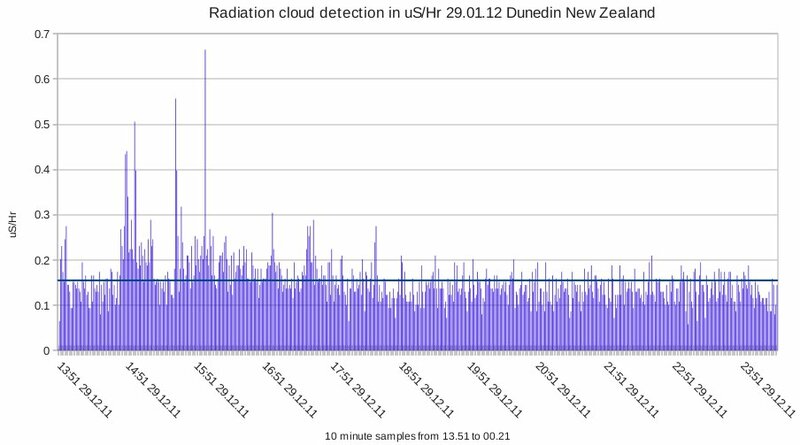 I have been in contact with a person In New Zealand who just sent me information of a detection of a high level radiation cloud passing over Dunedin New Zealand. You will find a copy of his email correspondence below. This chart is the recorded background radiation level during this event. Visual observation saw peaks reach an incredible 1.89 uS/Hr ! Now that I have regained my composure, I thought I would write. It has been a wild afternoon! I shall write you a report upon what was observed later, if you wish to publish it, you can. Feel free to include those images on your website. The steady-ish readings of 0.81 (photo) were taken when I came in off the street. It was briefly reading 1.89 on the street in the wind. I decided to come inside asap to the back yard, and then left the GS sitting outside for a while (0.25 photo) – checking on it. I’m in a relatively sheltered section. There was no way I was going to stand in ~2 microSieverts per hour in the wind!! No detectable radiation on me as such, it appears to be in the air. I can only speculate as to what it is. To be honest, it scared the cap out of me! I remember waste drums putting out 1.2 micros per hour … but almost 2 in the wind – well?! You don’t stand in that and wait around. So far, I’ve kept it relatively quiet from the press, and shall continue to monitor – as we have a rain front system approaching from the South. I’m not sure how to handle this, as I wish to maintain a very very low profile. Here is his follow up report. Please find the following notes. 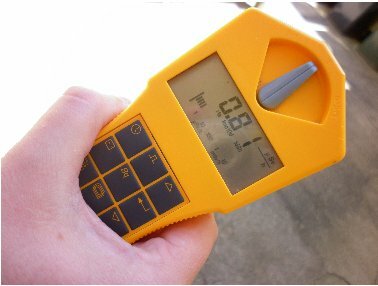 On Sunday 29/1/2012 at 13:30 local time an increase in radiation inside was noted. This was investigated, and found to be emanating from the atmosphere itself. Wind conditions were gusting to strong from the NW direction at the time. Standing in the street, a peak climbing rate of 1.89 microSieverts/hr was noted (the observer did not remain to see how high it would go, as it was considered unwise to do so). The Gammascout was reset to collect data (as its memory was full), and the sampling window set to 1 minute. Several excursions were made outside to investigate the conditions, and the results can be seen in photographs and in the logs supplied. These were recorded in a sheltered ‘back yard’. These logs did not record the peak events see earlier, unfortunately. From 16:51 events were recorded inside. The Gammascout memory was downloaded when it was full. Outside natural background average is 0.10-0.12 micro Sv/hr, inside average ranges from 0.15-0.18 microSv/hr. 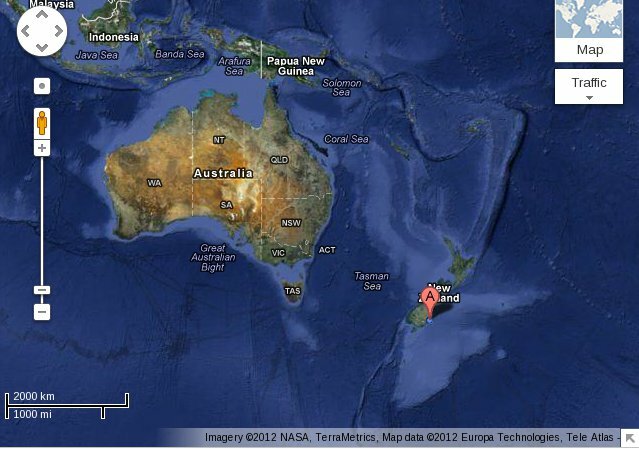 Here is the location of Dunedin. It is on the south island of New Zealand, what I considered to be one of the safest places on the planet, if a Nuclear disaster like Fukushima happened. So what is going on? Latest potrblog video provides a good explanation of what is happening with the jet stream air currents at present. A split in the jet stream has occurred which is driving some of the Fukushima fallout radiation into the Southern Hemisphere.